In November of 1976, I started a short Thanksgiving tradition of going to the theater to see Led Zeppelin’s The Song Remains The Same. Since the viewing was on Thanksgiving day, I (and whoever cared to join me) usually had the theater pretty much to ourselves. Last Tuesday, I picked up my own copy of the brand new Led Zeppelin concert CD/DVD package, Celebration Day. The tribute concert for the late Atlantic Records founder (and close friend of the band), Ahment Ertegun, was recorded on December 10, 2007, at London’s O2 Arena. Former Zeppelin PR man, Danny Goldberg, attended the show and, when I interviewed him a couple of years ago, he predicted that the band one once again tour and that it would be “a billion dollar tour”. Well, the boys haven’t yet decided to hit the road to grant us all the privilege of seeing them perform once again. However, when they do tour – and with several package variations of Celebration Day to prime the pump, I would dare say that the billion dollar figure might be a tad conservative. From the opening sounds of Good Times Bad Times to the final strains of Rock and Roll, the iconic band delivers sixteen memorable tunes from their vast repertoire of songs. In the CD/DVD package I picked up, the track listing on the CDs mirror the track listing on the DVD. And while there are certainly songs that are missing from the set list (such as Celebration Day or, say, even, All of My Love), what the band delivers pleased the crowd – and pleases the listener – to ecstasy. Plant’s vocals, while matured since the band’s original run, still delivers as needed; Page’s guitar mastery is still top-shelf and envied; Jones’s bass and keyboard work provides the subtle musical backdrop as intended and Jason Bonham is definitely make his daddy proud as he looks down on his son from Rock and Roll Heaven. 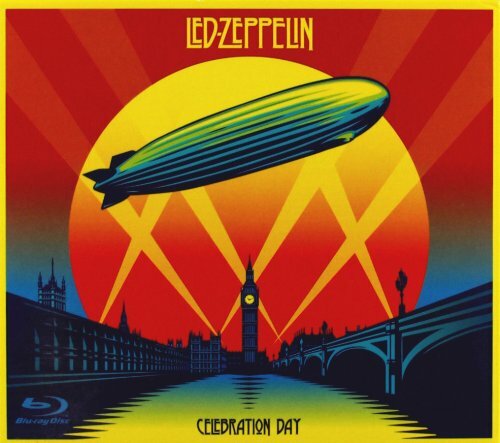 You don’t need me to tell you to pick up one Celebration Day because, chances are, you already have. For those of you who haven’t, what are you waiting for? By the way, I do believe that I have a new Thanksgiving Day tradition.